How would you explain solar power to pre-schoolers? The Kohl Children’s Museum prides itself with being hands-on. But how do you explain the effects of the sun’s rays without teaching kids to burn ants and possibly themselves in the bargain? 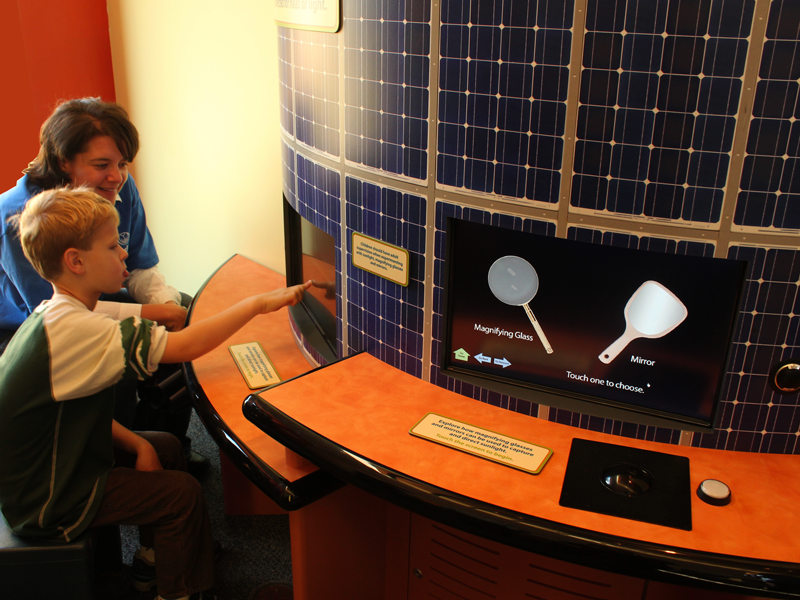 The Direct the Sun interactive uses two games, with spoken instructions and clear images and animation, to guide pre-literate children through experimentation to learn how solar energy can be reflected or concentrated. In one game, children learn how a lens can concentrate light and heat using a virtual magnifying glass. Then they are asked to predict the distance they would need to set the magnifying glass to reap the maximum solar power for melting popsicles and chocolate bars. In a separate game, visitors use a virtual mirror to bounce sunlight at different angles. One set of angles will direct sunlight to power a toy. Another set of angles will divert a ray to tease a mom. Guess which one the children love the best. The littlest kids are happy to just interact with the game on a basic level. Older students get through the initial mirror game and discover a more challenging second level game. Trillium worked hard to ensure that little children could have positive interactions with the experience. For example, we created larger target areas to compensate for their less developed motor skills, simplified the interaction, and clearly explained things using simple language, icons, and other graphics. We also made it robust. It was installed in late 2011 and the only complaint we’ve had is that the docents have to wipe the screen often because kids want to lick the popsicles and ice cream.